Captain Renault: Carl, see that Major Strasser gets a good table, one close to the ladies. Carl: I have already given him the best, knowing he is German and would take it anyway. Casino Worker: Your winnings, sir. Captain Renault: [Quietly.] Oh, thank you very much. [Loudly.] Everybody out at once. Question: Why did Ilsa jilt Rick in Paris when she was in love with him? Chosen answer: She was married then, and discovered that Lazlo was still alive. Question: Why does everyone stop and stare at the plane? Answer: It's a bit complicated and subject to interpretation. They all look as soon as they hear the engines starting. For each one it signifies something different. Ilsa knows she must part with Rick, the man she loves, and stay with her husband, Victor, to support him and help with his work. 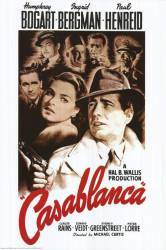 For Rick, he knows he is losing Ilsa, by his own choice because he has chosen to stay behind to aid the war resistance and may not survive. Victor knows his wife Ilsa really loves Rick and he will be out of their lives, but she is staying with him out of duty. Answer: Because the plane taking off meant that the people on board were on their way to Lisbon, and from there, America. Everyone is envious.